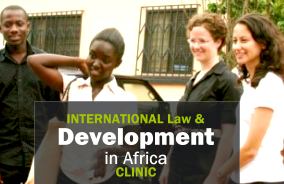 The opportunity to work with African lawyers and students is the defining element of the ILDA clinic and unique in American legal education. Blended teams of students provide several advantages, as they produce stronger, smarter projects by capitalizing on their respective strengths. Working effectively on a cross-cultural team also requires flexibility, adaptability, perseverance, and sensitivity—all skills that serve students well as future lawyers and leaders. ADR Project – Conduct interviews on customary law practices and ADR workshops for traditional chiefs and community leaders to build local capacity to conduct legally binding arbitrations. Application to participate in the ILDA Clinic is through the main Fordham Law Clinical Legal Education program. Please visit the CLE website for details.